Elizabeth Voss counsels clients in a wide range of industries on all aspects of employment and labor relations. Elizabeth has represented employers in multiple state and federal courts, as well as in administrative proceedings with the Texas Workforce Commission (TWC) and the U.S. Equal Employment Opportunity Commission (EEOC). 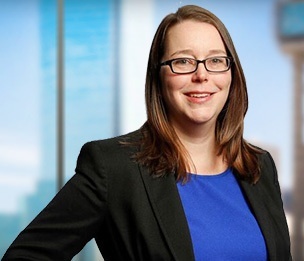 Elizabeth also represents employers in wage and hour issues, including the Fair Labor Standards Act (FLSA), the Texas Payday Law and regulations issued by Department of Labor (DOL). She counsels employers regarding compliance with other state and federal employment laws, including the Family and Medical Leave Act (FMLA) and the Pregnancy Discrimination Act, and assists with OFCCP compliance reviews. She also provides assistance with employment policies and agreements, including employment agreements, separation agreements, covenants not to compete and non-solicitation agreements. Residential care facility. Obtained summary judgment in the Western District of Texas in a case involving claims of national origin and religious discrimination and retaliation in violation of the Texas Commission on Human Rights Act (TCHRA) and interference, discrimination and retaliation claims under the Family and Medical Leave Act (FMLA). Transportation industry. Obtained summary judgment in the Western District of Texas on plaintiff’s sole remaining claim that she had been discriminated against in violation of the Americans with Disabilities Act because her employer regarded her as disabled after obtaining dismissal of plaintiff’s other claims. Transportation industry. Represented company before an Administrative Law Judge in a case involving a whistleblower retaliation claim under the Federal Railroad Safety Act. Following the first two days of hearing, obtained favorable resolution for client before resumption of proceeding. Vocational school. Obtained summary judgment in the Southern District of Texas against plaintiffs, former instructors of the school, who asserted claims that they had been misclassified as exempt from overtime under the Fair Labor Standards Act (FLSA). Restaurants. Obtained favorable resolution for clients through mediation before Federal Magistrate Judges in two collective action matters brought under the FLSA involving the potential loss of the tip credit. Commercial laundry. Represented company in a FLSA collective action filed in the Western District of Texas by former employee alleging unpaid overtime and seeking conditional certification of a class of current and former employees. Following pre-certification resolution with many potential class members, Plaintiff initiated settlement discussions that resulted in court-approved settlement. Oilfield services company. Represented company and employees in litigation involving claims of trade secret misappropriation and breach of restrictive covenants in parallel proceedings in state and federal courts. Following considerable briefing, favorable resolution was obtained for clients. Oilfield services company. Represented company in initiating litigation against former employees and new employer in litigation involving claims of trade secret misappropriation and breach of restrictive covenants in state court and in arbitration. Following considerable briefing, favorable resolution was obtained for clients. Technology company. Defended provider of computer hardware, software and related services and new employee in litigation against competitor relating to alleged improper use of confidential information.